What Is the Average Weight for a Quaker Parrot? 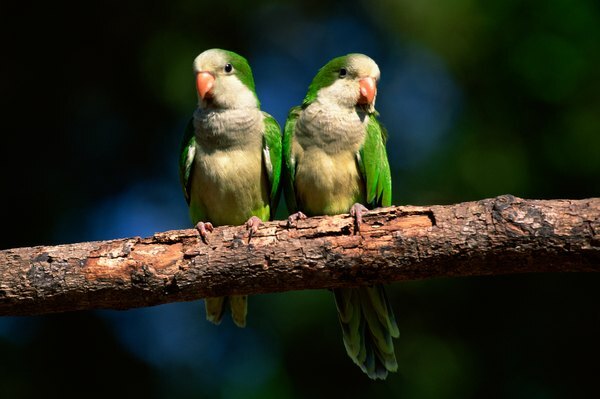 The Quaker parrot is a gorgeous species that often is referred to as the Monk parakeet. Highly intelligent and beautiful, the Quaker parrot is loyal and loving when kept as a pet. With a small size, this species is able to be kept in smaller homes, but still has the chatting capabilities that parrot owners love. The Quaker parrot originated in South America in such areas as Brazil, Paraguay and Argentina. Amazingly, wild colonies of this species are found in Florida and other areas of the Southeast. Some colonies even have been spotted in the Midwest. The Quaker parrot is roughly 12 inches long and weighs between 3.25 to 4.25 ounces. This species mostly is green in color with a gray face, neck and chest. Some Quaker parrots have color mutations that include cinnamon, blue and yellow, but these are much rarer. Building nests up to 7 feet across, the parrot lays 5 to 12 eggs at one time and can live between 20 and 30 years. Debate lingers over which foods the Quaker parrot should eat, but one thing is certain. Quaker parrots should never be fed a diet based solely on seed. While seed is a good treat and helps keep the beak filed down, a pellet-based diet is a better option for your feathered friend because such a diet does not allow him to pick and choose what he wants to eat. This ensures that he receives the best nutrition possible. Fresh fruits and vegetables also should be provided. There is debate over whether the parrot should eat 60-percent pellets and 40-percent produce or if the ratio should be 80/20. Quaker parrots are the most talkative breed of parrot and this means that they may not be best for everyone. This species can be loud and also is known as being an escape artist due to their high level of intelligence. On the other hand, the Quaker parrot has a high level of energy that makes him entertaining to watch as he climbs and plays with his toys. Keeping this species as a pet and avoiding aggression from the parrot involves spending time with your bird buddy on a daily basis. Finding fun activities to play together, such as hiding a favorite treat, also can help you bond with this intelligent species.